*Pseudomonas aeruginosa testing not currently available in the State of New York. Green nail syndrome, characterized by a greenish black discoloration of the nail, is caused by the growth and colonization of P. aeruginosa. Predisposing conditions can include: onycholysis, onychomycosis, diabetes mellitus, as well as occupations where feet are frequently exposed to wet conditions. The addition of P. aeruginosa to our onychodystrophy panel enables clinicians to identify one of the non-fungal causes of infectious onychodystrophy and treat it appropriately. Clinically relevant results in as little as 24 hours! Anderson, Bryan, and Christie Regula. 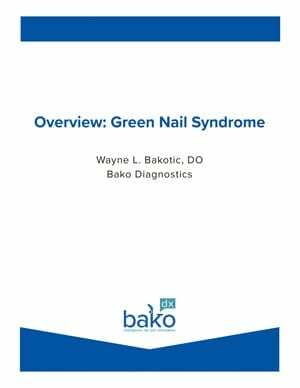 “Green Nail Syndrome (GNS, Pseudomonas Nail Infection, Chloronychia, Green Striped Nails, Chromonychia).” Dermatology Advisor, www.dermatologyadvisor.com/dermatology/green-nail-syndrome-gns-pseudomonas-nail-infection-chloronychia-green-striped-nails-chromonychia/article/691573/.